A native of Fort Myers, Florida, Ronnie is no stranger to putting forth his best efforts to attain seemingly impossible goals! From early childhood, he has received unprecedented academic and sports accolades - most notably, being eligible for an academic collegiate scholarship while still in middle school! Despite the drug-infested communities that surrounded him and the lack of a consistent male role model, Ronnie was determined that he would beat ALL odds! He enrolled in the University of Florida where he played cornerback for the 4xSEC and National champions, the Florida Gators. During one of his many tours across the country with the team, Ronnie has had the rare opportunity to personally visit with former President Bill Clinton. His ability to excel both on and off the field manifested in May 1998 when he received his Bachelor of Business Science in Advertising from Florida. 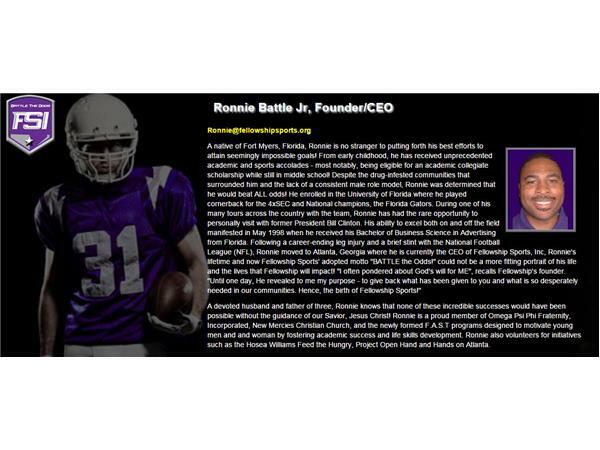 Following a career-ending leg injury and a brief stint with the National Football League (NFL), Ronnie moved to Atlanta, Georgia where he is currently the CEO of Fellowship Sports, Inc, Ronnie's lifetime and now Fellowship Sports' adopted motto "BATTLE the Odds!" could not be a more fitting portrait of his life and the lives that Fellowship will impact! "I often pondered about God's will for ME", recalls Fellowship's founder. "Until one day, He revealed to me my purpose - to give back what has been given to you and what is so desperately needed in our communities. Hence, the birth of Fellowship Sports!"